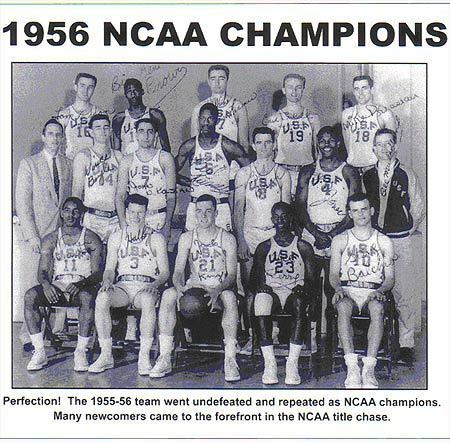 The 1956 NCAA Men's Division I Basketball Tournament involved 25 schools playing in single-elimination play to determine the national champion of men's NCAA Division I college basketball. It began on March 12, 1956, and ended with the championship game on March 24 in Evanston, Illinois. A total of 29 games were played, including a third place game in each region and a national third place game. This was the first NCAA tournament in which the four regionals were given distinct names, although the concept of four regional winners advancing to a single site for the "Final Four" had been introduced in 1952. San Francisco, coached by Phil Woolpert, won the national title with a 83-71 victory in the final game over Iowa, coached by Bucky O'Connor. Hal Lear of Temple was named the tournament's Most Outstanding Player. USF center Bill Russell might have cinched his second tournament Most Outstanding Player award if Temple's 5-11 Hal Lear hadn't scored 160 point in five games. But the defensive-minded Russell was everybody's Player of the year and established such an intimidating court presence that following the season, the NCAA passed the so-called “Russell-Rule,” extending the foul lane from six to 12 feet.